You can make calls by inputting any phone number, or by using the imported phonebook, call history, speed dial entries, or redial. Any voice-tagged speed dial entry can be dialed by voice from most screens. Press the button and say the voice tag name. Once a call is connected, you can hear the voice of the person you are calling through the audio speakers. While there is an active connection with Apple CarPlay, phone calls cannot be made with HandsFreeLink and are only made from Apple CarPlay. Go to the Phone menu screen. You can also search by letter. Select Search. Use the keyboard on the touch screen for entering name, if multiple numbers exist select a number. You can also swipe up or down to scroll through the list of contacts alphabetically on the steering wheel. Use the keyboard on the touch screen for entering numbers. Call history is stored by All, Dialed, Received, and Missed. Select All, Dialed, Received, or Missed. 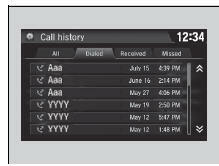 The call history displays the last 20 all, dialed, received, or missed calls. When a voice tag is stored, press the button to call the number using the voice tag. Any voice-tagged speed dial entry can be dialed by voice from any screen. Press the button and follow the prompts.